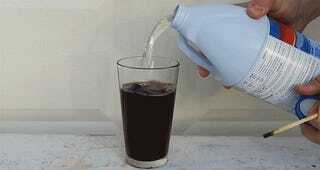 What Happens When You Mix Coca Cola with Bleach? Coke is delicious. Bleach is strong as hell. What happens when you mix the two? Crazy Russian Hacker did the work in finding out and it’s a fun little experiment because you get to see the color of Coca Cola disappear right in front of your eyes. Bleach is so powerful that it strips darkness away! Or something like that. Anyway, it’s a fun exercise.